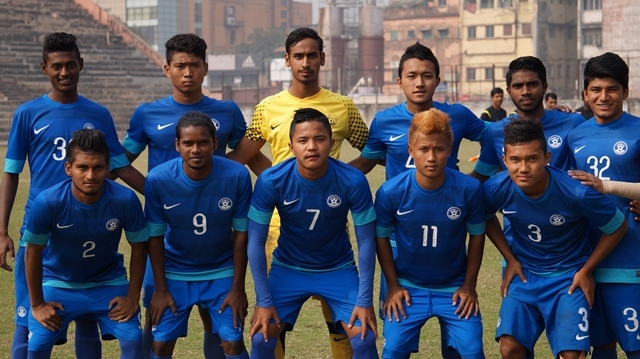 KOLKATA: Defending champions AIFF Elite Academy took on Aizawl FC in the first semifinal of the U-18 I-League at the Howrah Stadium on a bright Sunday morning. Elite Academy breezed into the finals courtesy a first-half strike from Prosenjit Chakraborty and a brace from mercurial midfielder Vlalengzama. The first half of the game was dominated by AIFF Academy as they struck in the 4th minute through Vlalengzama who headed in with a well-timed jump from the free-kick swung in from the left by Anirudh Thapa. The goal spurred Aizwal FC as they mounted a couple of attacks down the left flank courtesy their captain Rochharzela. The game settled down after that with Abhishek Haldar controlling the game for AIFF Elite Academy in the middle of the park. Vlalengzama doubled his tally in the 25th minute with a rasping drive from the edge of the 18-yard area to the top right hand corner of the net giving the keeper no chance. The goal seemed to affect the morale of Aizawl FC as they could not get a hold of the game. Elite Academy looked especially enterprising down their right through Prosenjit Chakraborty who made it 3-0 in the 29th minute with a deflected shot from the right. AIFF Elite Academy kept playing champagne football for the rest of the half as Abhishek Thapa and Anirudh Haldar kept tight control in the midfield not allowing Aizawl FC any room to garner attacking moves. AIFF Elite Academy kicked off the second half and in the early going they seemed to have eased off keeping in mind the impending final. Aizawl FC came out strongly and undertook a more physical approach. They pressed higher up the field and committed a few niggly fouls in trying to win back possession. The referee controlled the game very well as he cautioned a couple of players who got carried away in this high pressure scenario. Vlalengzama, who scored the first-half brace, was withdrawn early in the second half after he received a knock on his stomach. Aizawl grew into the game as Rochharzela made a couple of darting runs cutting in from the right. He came close to pulling one back in the 70th minute as his shot went agonizingly wide of the mark. AIFF Elite Academy immediately switched on and closed out the game without any scares.